Marketers are fighting the clutter and seeking more ways to integrate their brand into consumer's busy lifestyles. In an effort to drive long-term brand affinity, global brands spend millions of dollars a year on experiential marketing, hoping to build awareness, create brand loyalty, and in many cases to collect consumer data. Events align with consumer's passion points and lifestyles but we are also starting to see semi-permanent pop-up experiences gain traction in the industry. The pop-up store also filled a void in the experiential portfolio, allowing semi-permanent activations that can give consumers the opportunity to get more information as well as interact with your brand and products in a more established format, without the commitment of a long term brick-and-mortar location. More and more brands are setting up experiential pop-up activations that in the past would have been temporary, now are staying for weeks, months or even years based on their success to date. These new activations are obviously great opportunities to connect with consumers, but do brands know that these locations are perfect opportunities to capture data, test out new engagement strategies and to learn how to optimize their larger strategy for higher ROI? Just like activating at the Super Bowl or music festivals, these pop-ups are a prime location to collect consumer data. They are typically more inviting than a standard mobile activation. Semi-permanent activations are also becoming a real focal-point for both social and traditional media. For the social teams, this creates the opportunity for consumer generated social content. This can be organic or it can be more planned by using experiential technology for social sharing. From a traditional media perspective, these long-term activations are great content creators. Think of the success that Bud Light had with the "Whatever USA" experience. Even though it was a live event that lasted for a week, the footage from the experience was used to promote their brand across all channels. This was effectively their marketing strategy for an entire summer. While many pop-ups are produced by retail or CPG brands, many other verticals like auto, insurance and personal finance are also getting heavily involved in this emerging trend. Auto, specifically, has embraced the semi-permanent pop-up trend, setting up in tourist areas, shopping malls, and airports among others. With the high lifetime value of a customer, industries like auto need to treat pop-ups the same way they would an auto show and make sure they are capturing as much consumer data as possible in order to distribute leads in a timely manner. One great example of these semi-permanent pop-ups within the auto industry are "FordHubs", with locations opening in New York, London, Shanghai and San Francisco. These are urban storefronts that allow consumers to "explore the company's latest innovations, learn about its mobility services and experience exclusive events." 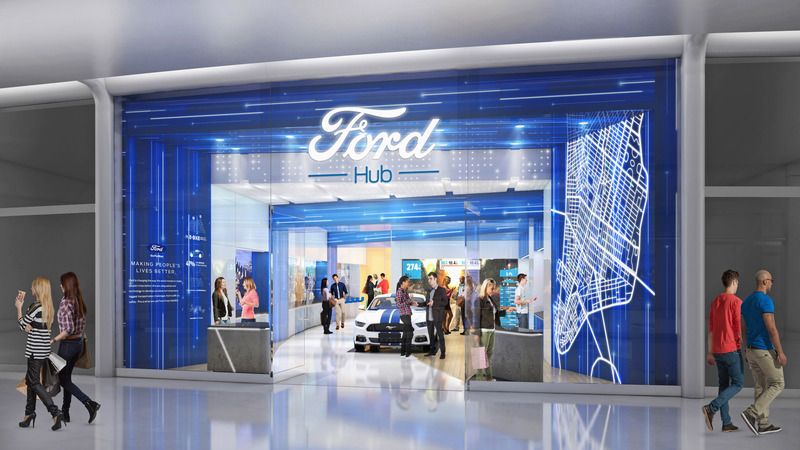 The first semi-permanent FordHub will open later this summer at the Westfield World Trade Center in New York. To learn how eshots can help you maximize your ROI at experiences of all sizes, visit www.eshots.com or email us at info@eshots.com.